Most of our guides are also qualified and experienced in other related outdoor activities. For this 2015/2016 season we have great guides whose experience totals around 45 years of guiding and all of us get out there on our own adventures whenever we can..! Guides: Dave, Diana, Riki, Anna & Jeremy. Dan (Chucky) is the head honcho. Dan has tons of recreational and professional experience in canyoning and managing staff in technical work environments where saftey is a priority. 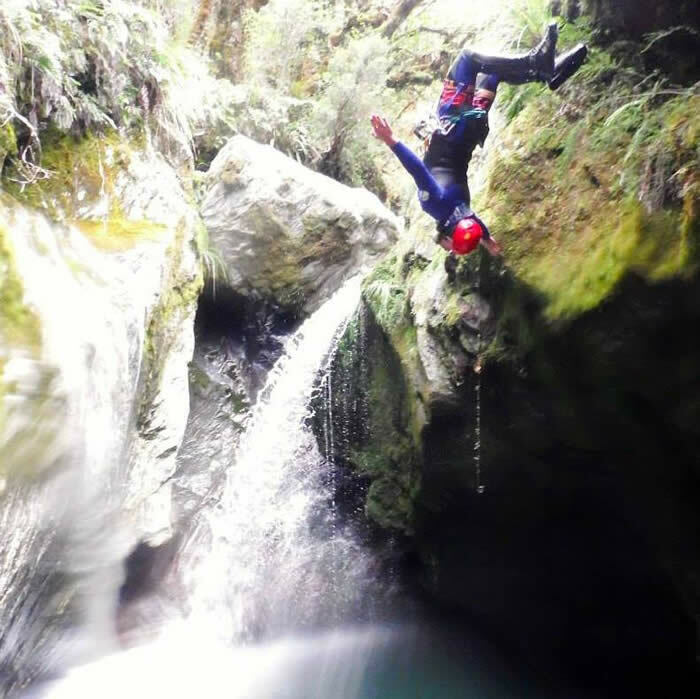 He lives in Wanaka and recently published the first definative guide on New Zealand Canyoning, well known and liked in the canyoning community we are stoked to have him lead the crew at Deep Canyon. Diana has been on the run from winter for a while now she does this by hiding in the Swiss/Austrian mountains for half the year where she works for an outdoor company that specialises in canyoning, rafting and school programs. The other half of the year she looks for new exciting places to go canyoning and NZ is lucky to have her back for the third season in a row. Diana has the Austrian canyoning and rafting qualification. Riki is a Kiwi boy and in his 4th year of canyon guiding. He has just returned from another season guiding in Ticino, Switzerland. Now back in his beloved home country, he is looking for new beautiful places and new adventures. If you don’t find him in a canyon he will probably be somewhere on a mountain, in the sea or on a river - always keen for anything that’s got to do with the outdoors. CIC and SOA canyoning guide qualification. 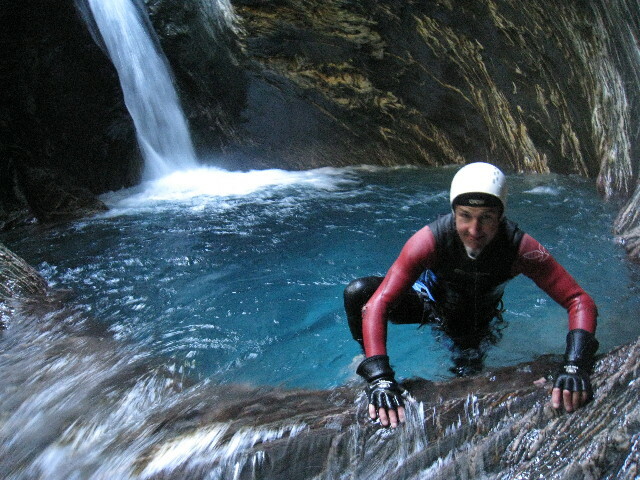 Anna's canyoning history started 16 years ago in a big company full of very experienced guides. She took her passion for guiding and started her own company in Spain, Explora Guies. She aspires to use this company and new found experiences in the glorious canyons of New Zealand to try and progress the world of canyoning. She has been canyoning in France, Israel, Jordan, and Spain. 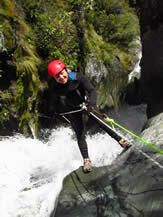 Anna is returning to guide for her second season in the canyons around Wanaka as she just loves canyoning in this area. Jeremy has been working and playing in the outdoors for the last 17 years, as a sea kayak guide, adventure therapist and alpine elevation technician. When not in a canyon Jeremy loves snow boarding, mt biking, white water and sea kayaking and is always up for an adventure! Jeremy has a Bachelor degree in Adventure Recreation & Outdoor Education and loves to share adventures with people of all ages & walks if life in the outdoors. This is his second season with Deep Canyon. Dave is the owner and has been since starting the company um, way back - when it was the first one. Dave has tons of recreational and professional experience in ice, rock and mountain climbing, caving, river trips, rope access work, search and rescue and a few other things besides. More recently it's been freediving. Oh, and of course canyoning in which he is a pioneer of the NZ canyoning scene with lots of exploring and first descents. He is an assessor on the NZOIA canyon guides programme. Dave is currently taking a back seat from guiding but is acting as a knowledge bank for Deep Canyon guides and staff. The shadowy figure behind the scenes, without who things would - well who knows what anarchy would reign at Deep Canyon without Ros… Having moved on from guiding, Ros is now the brains of the operation - the wonder-woman of the show… All hail Ros..! Rachel, a Boston Native from the U.S., considers herself a digital nomad. When she is not online helping run our online marketing strategy, she is fully taking advantage of the natural playground New Zealand has to offer. Some of her hobbies consist of mountain biking, running, snowboarding and tramping. Rachel runs social media at Deep Canyon.